Hyacinth bean or fujimame in Japanese is a rich source of dietary fiber, folic acid, and potassium. 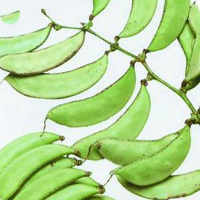 However compared to other varieties of beans it is lowering in protein content and other vitamins and minerals. The calories in Hyacinth Bean per 30g(1pod) is 10 calories. Hyacinth Bean is calculated to be 33Cal per 100 grams making 80Cal equivalent to 242.42g with 2.22g of mostly carbohydrates、0.75g of protein、0.03g of fat in 30g while being rich in vitamins and minerals such as Vitamin K and Folate.